I just received a Gold Card member email from Starbucks about a deal on Frappuccinos, and I thought I'd do a little advertising for them. I may or may not be a huge fan. 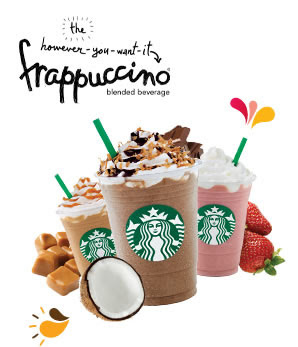 According to the email, you can enjoy half-priced Frappuccino blended beverages - May 6-15, from 3-5 p.m. Not going to lie, working where I do, in such close proximity to a Starbucks everyday, I'll probably partake at least twice during this special.